The Goshawk luxury dog bed design has a grey herringbone wool top with a black herringbone base. Weardale Wolf's luxury dog beds are made with the finest British wool. Hand crafted by their inhouse team of dedicated sewing artisans to create a stylish, eco-friendly, luxury dog bed to compliment your home. 95 % of the dog beds materials are fully recyclable and sourced within 150 miles of our production unit. Weardale Wolf's dog bed inserts are sourced and manufactured in the UK to the highest industry standards with a higher than average filler of extra comfort and shape retention. 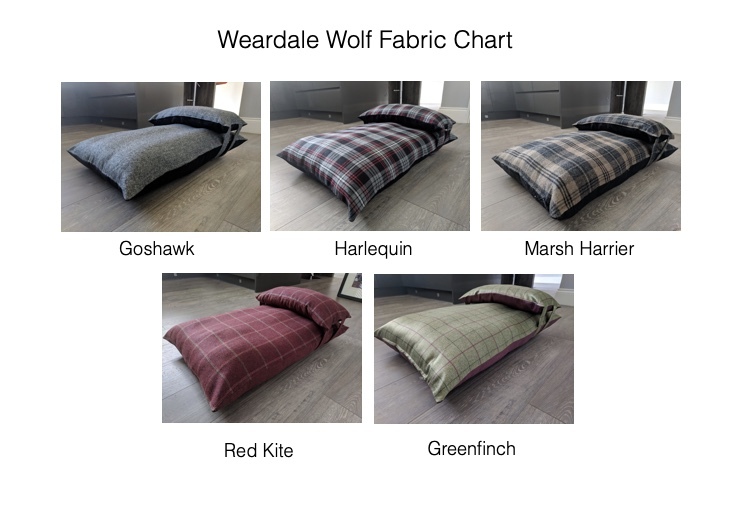 Weardale Wolf's luxury dog beds are designed with luxury fabrics on both sides, so you can choose the combination you would like the bed to be displayed without any loss of quality. As Weardale Wolf's dog beds sizes are exclusive to them please review sizing before making your order. When ordering your new Weardale Wolf luxury dog bed with head pillow, we highly recommend ordering a set of spare covers to go with it. You can either order matching spare covers so you have two identical sets or why not choose a different fabric for your spare covers to create a fresh look. Please make sure you select the correct option for your spare covers in the menus above. If you are ordering a medium bed, you will need the medium size spare covers! Weardale Wolf does not use generic dog beds shipped in from China. They have spent time working with their UK supplier to develop a premium dog bed that works with their luxury covers to create a great looking and comfortable bed for your dog. Whilst keeping to their Eco-friendly principals in limiting fabric wastage and miles travelled. All Weardale Wolf dog beds are the same design and standard shape exclusively manufactured for their covers. This mean once you have the dog bed inners you can mix and match from their other bed and pillow covers in any of their designs. Wool has a natural odour-resistance, stain-resistance and ability to bounce back to its original shape. This means unless you have a really mucky pup the bed should be fine to be dry cleaned every 3 – 6 months. For best results wipe clean any marks or stains as soon as they happen and vacuum often. Made in England by Weardale Wolf. You must return the item to us within 28 days in saleable condition and you are responsible for the cost and risk of return so please ensure you take out the correct postal insurance. In the case of an exchange of size, you will also have to pay the difference if there is any.